For Palestinians and people of conscience everywhere, 2014 will be remembered as the year in which Israel carried out its bloodiest ever massacre of Palestinians in the besieged Gaza strip. 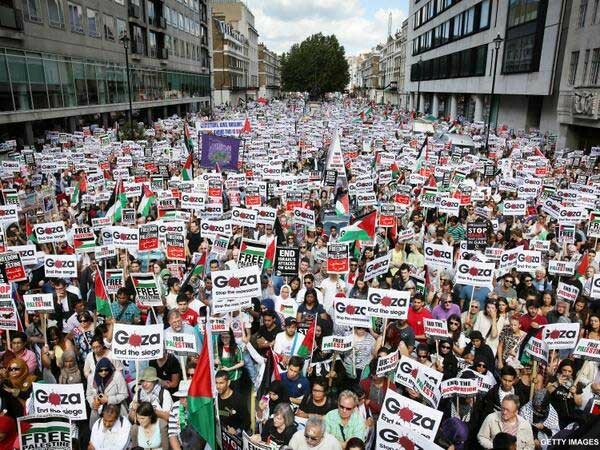 2014 was also a year of resistance that saw continued resistance and unprecedented international solidarity with Palestine and huge steps forward for the boycott, divestment and sanctions (BDS) movement. Here's our round up of some of the key BDS developments of 2014. The Palestinian Boycott, Divestment and Sanctions National Committee (BNC), the coalition of Palestinian civil society organisations that works to lead and support the boycott, divestment and sanctions (BDS) movement, warmly thanks each and every person who supported and contributed to the BDS movement this year. If you can, please consider making a donation to our first ever fundraising appeal. It'll help us to produce the resources and research our movement needs to make an even greater impact during 2015. The year opened with an international controversy over the decision of Hollywood A-lister Scarlett Johansson to become a brand ambassador for SodaStream, the Israeli drinks machine manufacturer that operates a factory in an illegal Israeli settlement. The move attracted particular attention because the Lost in Translation star was also an ambassador for Oxfam, an international NGO that condemns illegal Israeli settlements. Oxfam faced huge pressure to ditch Johansson and publicly criticised her decision. Ultimately it was Johansson who brought the saga to a close when she stepped down as an Oxfam representative, but not before social media memes about her support for Israel's apartheid regime had gone viral and the BDS movement had received unprecedented international media attention. SodaStream's share price suffered the first of many hits. Dutch pension giant divests from Israeli banks In a move that laid the foundation for other European funds to follow suit later in the year, Dutch pension fund PGGM announced it was divesting tens of millions of euros from 5 of Israel’s biggest banks due to their deep involvement in Israel's crimes against Palestinians. The fund manages the pensions of 2.5 million people. Veolia loses $4.5bn Boston contract Campaigners in Boston celebrated after French multinational Veolia lost out on a $4.5bn contract following a vigorous campaign denouncing the company’s provision of infrastructure to illegal Israeli settlements. 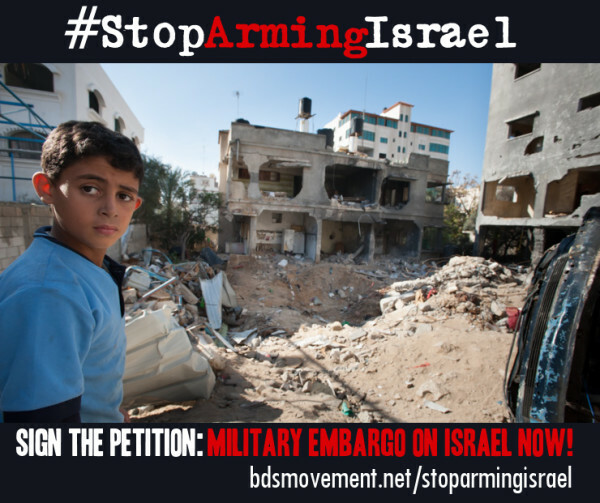 Friends of the Earth International joins a growing BDS campaign January also saw Friends of the Earth International signal its support for the campaign against Israeli state water company Mekorot and other boycott and divestment campaigns. Norwegian singer Moddi cancels a scheduled gig in Israel His decision was in direct response to a vigorous social media campaign led by BDS activists in Gaza. The Buenos Aires municipality suspends a $170m water deal with Mekorot following a campaign over its role in Israel’s system of ‘water apartheid’. 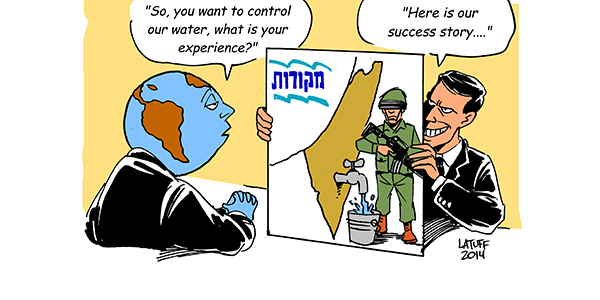 Mekorot was further targeted in a week of action that began on World Water Day. Victory in Galway as Irish students’ Uunion votes to join BDS movement The motion at the National University of Ireland in Galway was passed by an almost 2 to 1 margin and follows on from the Teachers Union of Ireland’s 2013 endorsement of an academic boycott of Israel. Earth Day Network Cuts Ties with SodaStream SodaStream had been a partner of the Earth Day initiative as part of its efforts to greenwash its role in Israeli apartheid until BDS pressure persuaded it to abandon its links with the Israeli exporter. 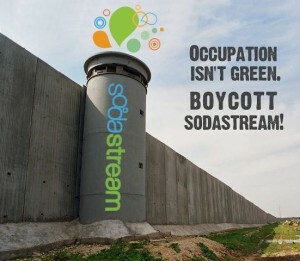 SodaStream attempts to "greenwash" its role in Israeli apartheid by marketing itself as environmentally friendly. Israeli state water company loses Portugal deal Mekorot faces second major set back in as many months as Lisbon’s water company EPAL announced that it terminated a technology exchange deal following pressure from Portuguese MPs and campaign groups. Divestment movement continues to sweep across US campuses Students at the University of New Mexico, Wesleyan University in Connecticut, and University of California Riverside vote to support divestment from companies that help Israel violate international law. Meanwhile, the largest student petition in Florida’s history calls for divestment. Europe’s largest teachers’ union endorses Israel boycott call The UK's National Union of Teachers votes to back the UK Trade Union Congress boycott policy. Rapper Talib Kweli (talibkweli.com) canceled plans to perform in Israel after appeals by supporters of the Palestinian campaign for boycott, divestment and sanctions (BDS). “As much as I want to play Israel, I have decided not to in solidarity with Palestinians who will not have access to my show,” he wrote on Twitter. 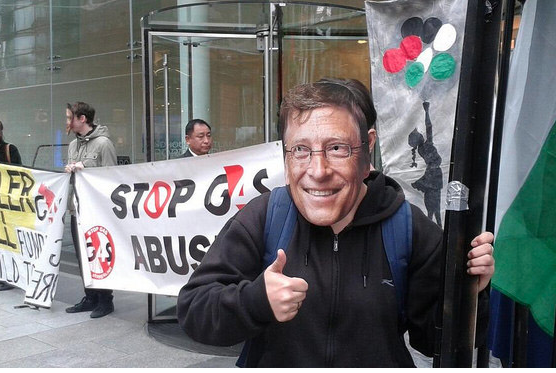 The Bill Gates Foundation, one of the largest private foundations in the world, divests from G4S. A petition signed by more than 14,000 people and demonstrations outside Gates Foundation offices in London, Johannesburg and Seattle called on the the Gates Foundation to divest from G4S because of its role in providing equipment and services to prisons where Israel holds and tortures Palestinian political prisoners. EU bans poultry exports from illegal Israeli settlements The decision was an implementation of the EU’s commitment not to recognise Israeli sovereignty over occupied Palestinian territory, which came as a result of grassroots pressure and advocacy. 17 EU members take action against corporate complicity with Israeli crimes Before Israel's attack on Gaza had begun, more than 17 European governments had published online guidance warning firms of the risks involved in trade and other economic links with illegal Israeli settlements. The policy announcements followed grassroots campaigning and advocacy on the issue. Authorities in Kuwait announce they are excluding Veolia from $750m contract following campaigning by Kuwaiti groups and the Palestinian Boycott, Divestment and Sanctions National Committee (BNC). Veolia announces sale of Israeli businesses It also emerged in September that French multinational Veolia, which has lost billions of dollars of contracts as a result of campaigns over its construction of infrastructure for illegal Israeli settlements, intends to "step back from Israel as a market place" and sell most parts of its Israeli interests during 2015. 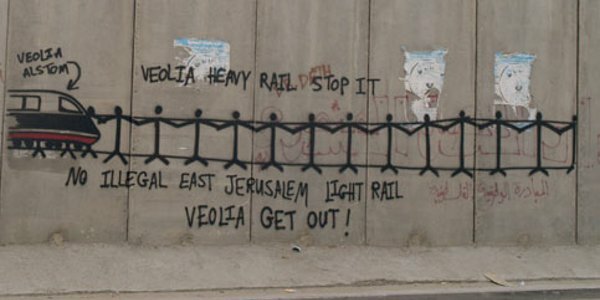 The campaign against Veolia must continue until it actually ends all aspects of its participation in Israeli violations of international law, including its involvement in illegal Jerusalem Light Rail project. 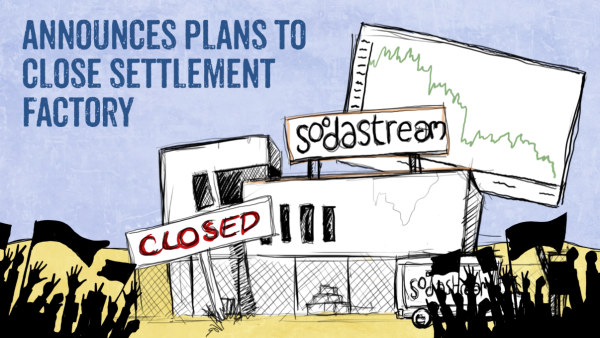 SodaStream announces it is to close its factory in the illegal Israeli settlement of Mishor Adumim following a high profile boycott campaign against the company that saw retailers and investors across the world cut links with the company. However, SodaStream reveals it is to benefit from Israel’s displacement of Palestinians in Naqab, and states that the factory shall remain open until some time during 2015. The campaign against SodaStream continues. Kuwait boycotts 50 companies over role in illegal Israeli settlements The blacklisted companies include some of the top corporate targets of the BDS movement, such as Veolia, Volvo, Heidelberg Cement, Dexia, Pizzarotti and Alstom. G4S loses out on Irish government contract Palestine activists campaigned against G4S being awarded the contract over its role in Israeli prisons and checkpoints. Los Angeles activists block unloading of Israeli cargo ship for two days The Block the Boat coalition of Los Angeles claimed another victory, delaying an Israeli cargo ship for more than 34 hours. Israel excluded from Italy military exercises after protests Public pressure forces the Italian government to exclude the Israeli military from joint military exercises it was due to take part in. 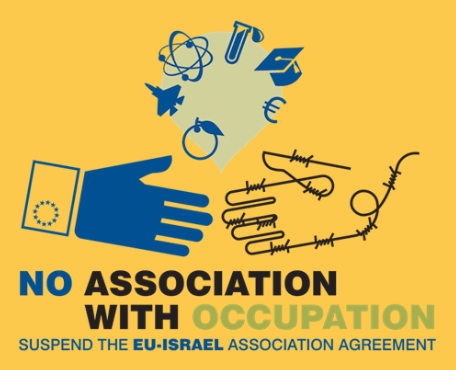 November - Leading European unions and parties call for end to EU-Israel trade pact More than 300 political parties, trade unions and campaign groups call for the suspension of a the EU-Israel Association agreement that facilitates largely unrestricted trade between the EU and Israel and allows Israel to participate in a wide range of the Union’s programs. Signatories to the call include Podemos, the leftist party currently leading the polls in Spain, the Irish Congress of Trade Unions and other major national trade union bodies from Spain, Denmark, France and Belgium. More US and UK campuses vote to join divestment movement The University of California at Los Angeles becomes the sixth of nine undergraduate campuses in the UC system to call for divestment, while the biggest ever student referendum at the University of Exeter calls for the student union to join the BDS movement. Major campaign success against G4S in the US Durham has become the first U.S. municipality to boycott a company because of its role in Israeli violations of international law. 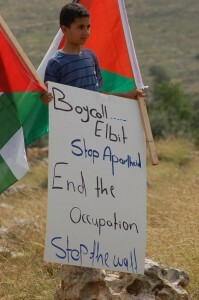 The Brazilian state of Rio Grande do Sul cancels a major collaboration deal with Israeli military company Elbit Systems in the wake of protests over the firm’s role in oppression of Palestinians. 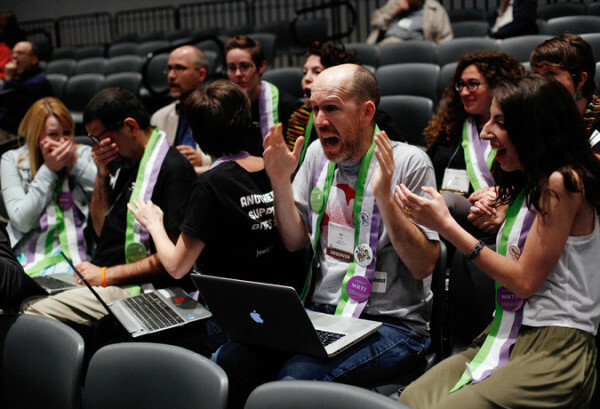 US student workers’ union becomes first US labor union to back BDS Student workers at the University of California have voted by a landslide to support the Palestinian-led boycott, divestment and sanctions (BDS) campaign against Israel. Olive Declaration of UN conference calls for action The UN-backed International Conference of Governments and Civil Society Organizations in Support of Palestinian Rights has called for municipalities to take action in support of Palestinian rights.